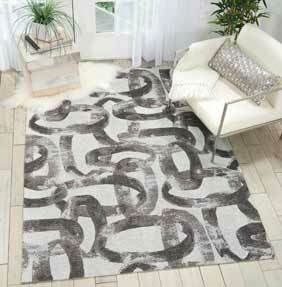 Elegance and class are central to the design of each Organic Modern rug by Nourison. This collection shows off some of the finest textiles making skills as traditional patterns and weaves are expertly mimicked in newer yarns and fibres. Each Organic Modern rug features a cleverly subtle textured finish and the collection shows off a range of both simple and subtle designs, as well as some bolder, more eye-catching patterns. Each rug in the Organic Modern collection is constructed with the look and feel of a traditional jacquard weave and each rug adds elegance to rooms which may be lacking in character, or the final piece of the puzzle. Each Organic Modern rug is crafted from high quality 100% polyester and is woven with great care by hand.